Are you new to OptionsXpress? Awesome, you’ve made a great decision. OptionsXpress is really a great company to work with, and they provide tons of tools that will make investing an easier task. However, if you don’t know what those tools are, you may be a bit lost at first. So, today, we’re going to go over my 3 favorite investment tools they offer and why they’re so important. See OptionsXpress Pricing and DetailsGet 50 free trades today! This is the single most important tool OptionsXpress offers to first time investors. Investing can be tricky; very tricky. If you don’t know what you’re doing, you could lose a lot of money right off the bat. But, that would be OK if it was Monopoly money right? Well they give you the opportunity to start investing with what can be compared to Monopoly money. Essentially, they give you a virtual (fake) balance and allow you to trade. Your fake balance allows you to test your strategies to see how accurate they are with absolutely no risk. After all, it’s funny money! If your ideas flop, start over and come up with a new plan. Eventually, you’ll do well in the virtual market and be ready to move to the big league. Although this tool has proven to be useful for both new and seasoned investors, I’d definitely recommend getting to know it as soon as you get started. Coming up with great investment ideas can be tough, mind numbing work. Through a very graphically rich and easy to understand display, OptionsXpress provides information that will help you come up with trade ideas. The information in the Idea Hub is real time and run by sophisticated algorithms that give you the upper hand. It allows tons of options including the ability to research ideas by how you like to trade; bullish, bearish, or neutral. As you’ll soon learn, having tools like this in your toolbox will definitely save you time when it comes to investing. Finally, the trade and probability calculator is incredibly important. Although you may test your ideas in the virtual market, when it comes time to actually tap your account and take a risk, it’s important that you have a good idea of what kind of risk you’re taking, what kind of reward you might get, and more. The trade and probability calculator is designed just for that. The calculator gives you a good idea of what your potential profits and losses could be, as well as the buying power needed to make an investment profitable. This information will prove to be invaluable in the future. Well there you have it. 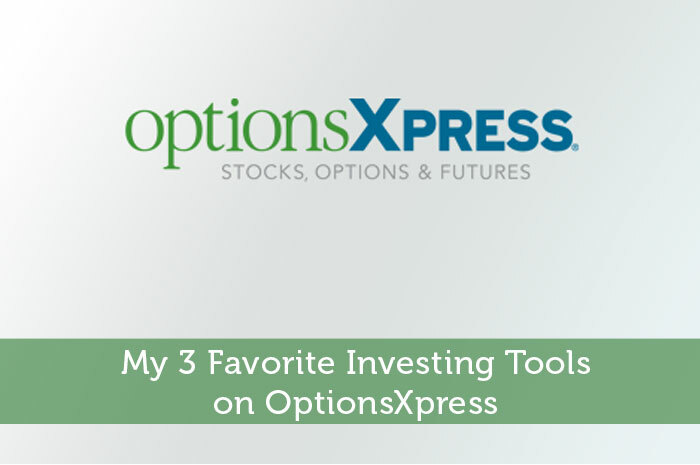 These are 3 of the most important tools that newbies to OptionsXpress should learn about. Doing so will help you make sound decisions when it comes to where you’re going to invest your money. However, these aren’t the only tools available. There are all kinds of charts, graphs and other research and discovery tools. To learn more about OptionsXpress, check out our review!